This review first appeared in the July 13, 2006 issue of the North County Times. 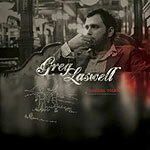 A highly stylized alt-rock release, Greg Laswell's "Through Toledo" (released on the national folk label Vanguard) is an often-interesting album with some nice touches of accessible pop melodicism. Still, as many times as you are ready to fall into the luxurious embrace of his music, the connection with your heart is momentarily broken by a production level or two too many. Once that connection is broken, it's hard to re-establish. It ought to be easy to fall in love with Laswell's music: He writes pretty little melodies, has a distinctive yet attractive singing voice, and as a full-time music producer in San Diego, knows his way around a studio. But it's that production that gets in the way too often here. Seemingly every instrument and his voice are run through at least two effects boxes (or at least augmented via mixing software)  forget Phil Spector's Wall of Sound, this tends toward a Niagara Falls of sound. There are times you just want to hear Laswell sing and play without all the filters between his talent and your ears. Such moments are all too rare on this outing.